Jim rescued this post many years ago from an abandoned portion of the NS&T’s Grantham Division, which ran from the main terminal in St. Catharines Ontario to a lake boat connection at Port Dalhousie East. 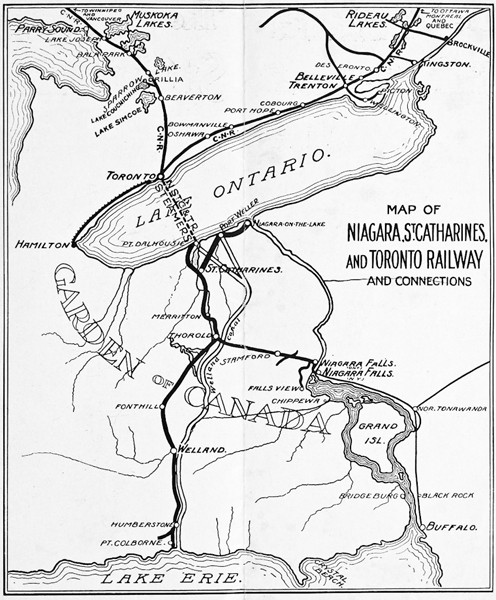 This Division was originally built in the mid-19th Century as part of the Welland Railway – a line that paralleled the canal to transfer grain and other bulk commodities between steamships on Lake Ontario and Lake Erie. The Grand Trunk Railway leased the Welland Railway in the 1870s and acquired it outright in the 1880s – and it’s likely that the whistle post was built during the GTR’s ownership. The GTR later became part of the CNR. 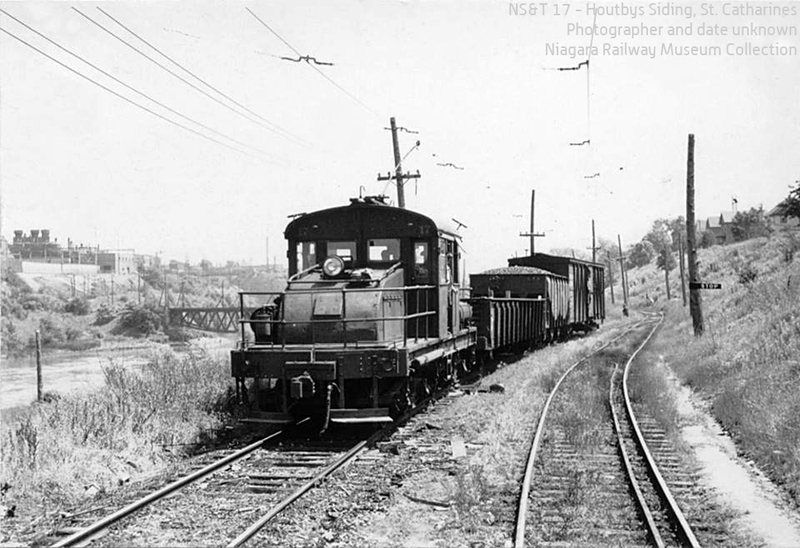 As part of its improvements to the NS&T in the mid-1920s, the CNR electrified this line in 1924-25 then leased it to the NS&T on January 1, 1926. 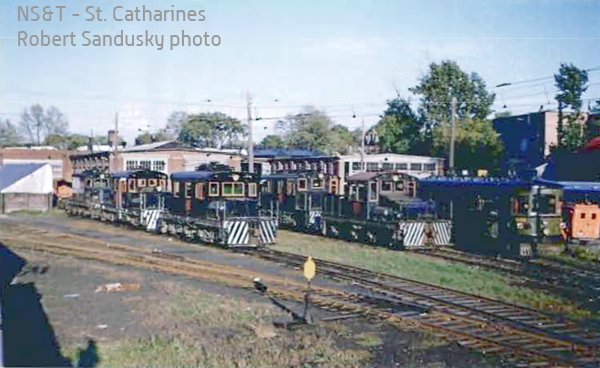 The Grantham Division would be used by mainline passenger trains – connecting with NS&T lake boats out of Toronto at Port Dalhousie East to take tourists to Niagara Falls. 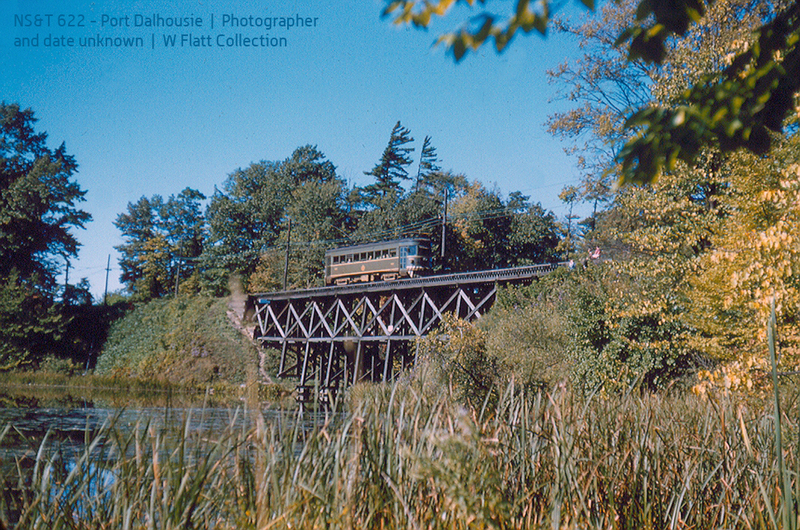 This whistle post would’ve regularly warned the motorman at the controls of the NS&T’s handsome wooden interurbans to alert motorists of their presence as they carried loads of tourists to (or from) a day in the Falls. The last of the boat trains ran in September 1947, and the passenger shelter at Port East was torn down in 1951. 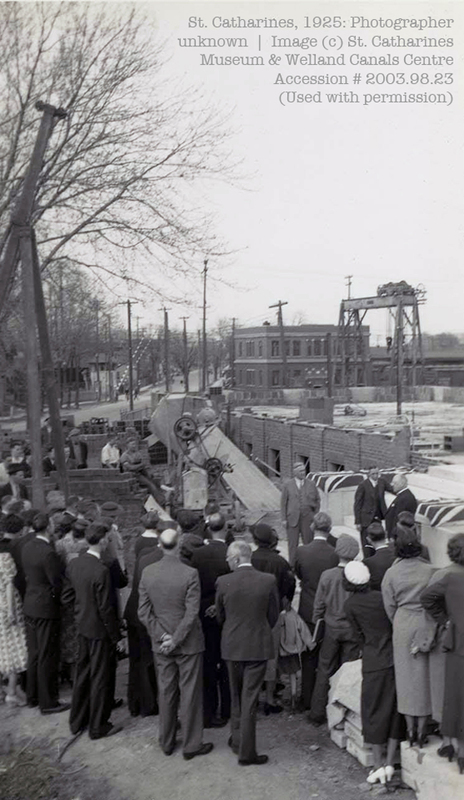 The line continued in operation for freight – the Port Dalhousie East terminal also featured a bulk coal transfer facility – and was used for at least one fan trip under wire, in 1953. As with the rest of the NS&T, I assume the wires came down for good in 1960. I’m not sure when the rail itself was abandoned but it does not show up on the mid-1980s CNR track maps in my collection. 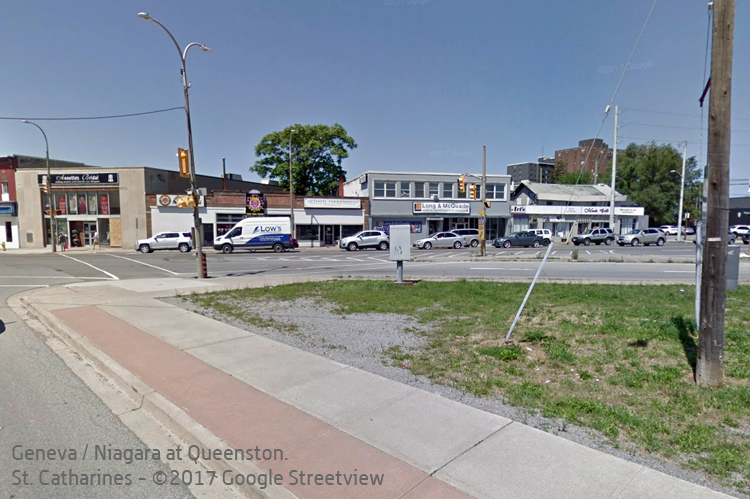 Many years ago, Jim would walk his dog along a portion of the abandoned Grantham Division that ran on an embankment behind the Fairview Mall in St. Catharines. When he learned that this embankment was to be flattened to make space for more parking lot at the mall, he knew that the whistle post would either be plowed under or sent to landfill. He recruited a friend and rescued the post from oblivion. For many years now, the post has resided in Jim’s backyard, lying on its back and mounted on blocks – disguised as a garden bench. He offered it to me about a year ago, but it’s taken this long for me to get my act together to collect it. Why the delay? For one thing, I thought I would require the help of a friend to load it at Jim’s and unload it at home. As it turns out, two people could handle its 200 pounds without too much trouble, so Jim and I loaded it at his place. At home, I received help from the architect/contractor with whom we’ve been working to renovate our house for the past several years. That renovation is about to include a remodelling of the garden, and you can learn more about the new home for this whistle post on my Adventures in Live Steam website. The NS&T built Car 83 (as well as the second car to carry the number 82) in 1925. It had 72 seats and weighed 80,000 pounds. 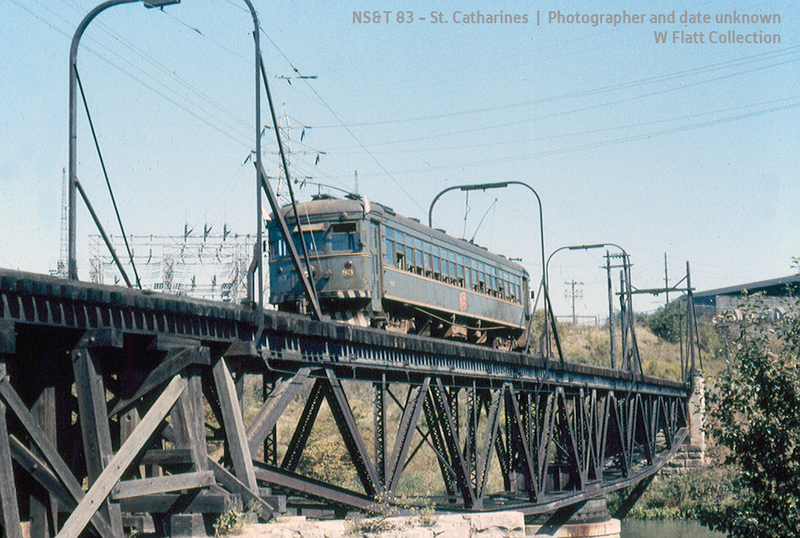 Interestingly, the NS&T built 83 not for itself, but for the Toronto Suburban Railway as that line’s number 107. The car came home to the NS&T in 1935 and was stored out of service. That changed with the demands placed on public transit by World War II. 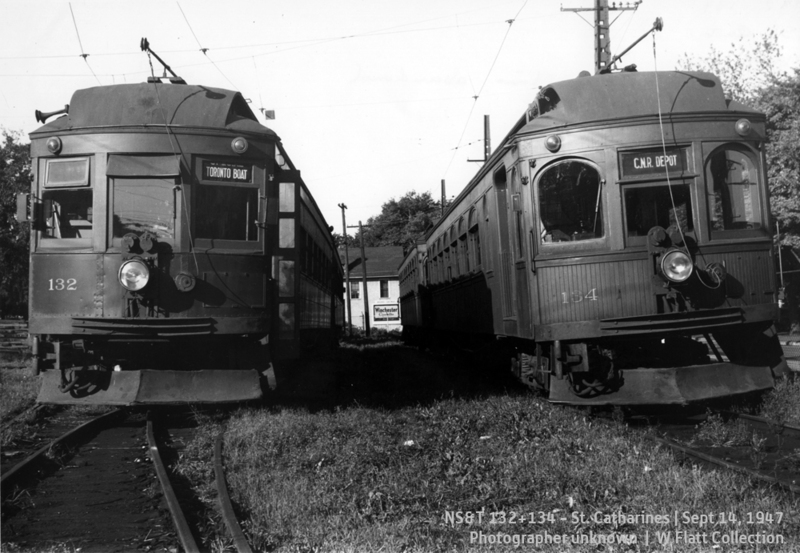 The car entered service on the NS&T in 1943, on trucks salvaged from NS&T Car 80 and 600-volt electrical equipment out of Car 133. 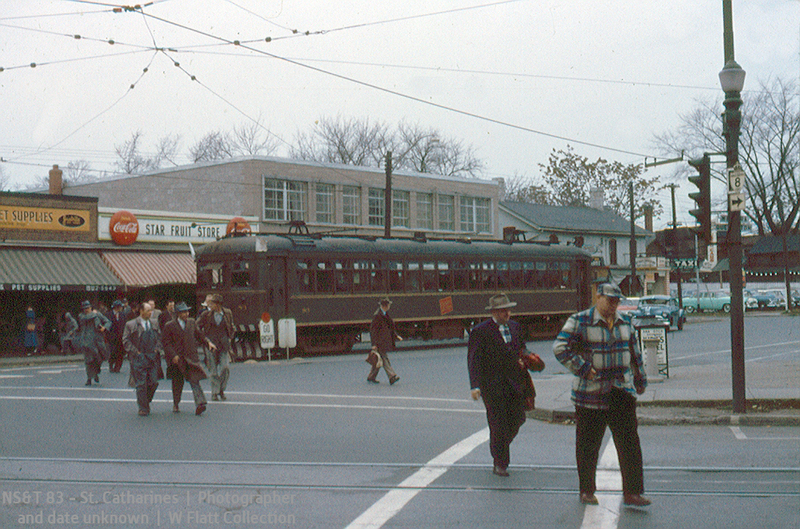 Originally painted in the two-tone scheme, Car 83 was repainted in the mid-1950s into the CNR green scheme shown here. It was scrapped in 1959. 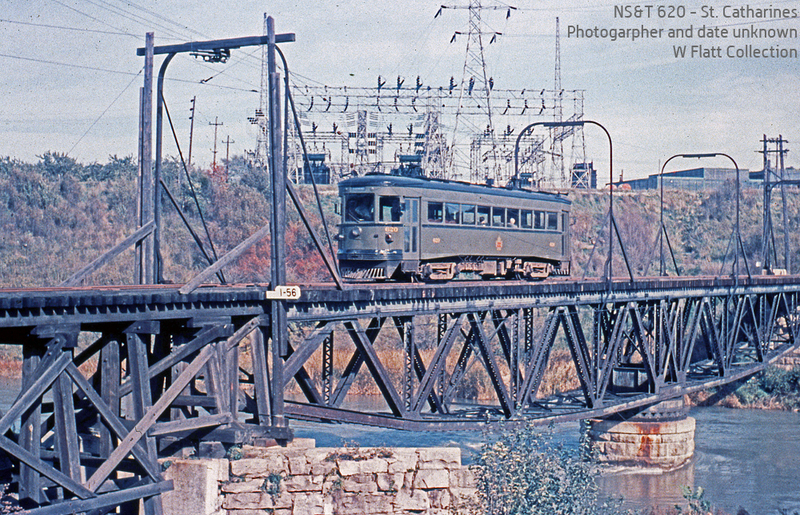 While the NS&T is long gone, the intersection looks a lot like it did back in the 1950s. The same block of buildings stands, with different tennis. Even the parking lot to the north (right) is still there – although in the earlier view, it appears to be a car dealership. This photograph was taken just east of the location where – on a different day – NS&T steeple cab 14 was caught hauling a boxcar to the factory on Phelps Street, which I shared in a previous post. 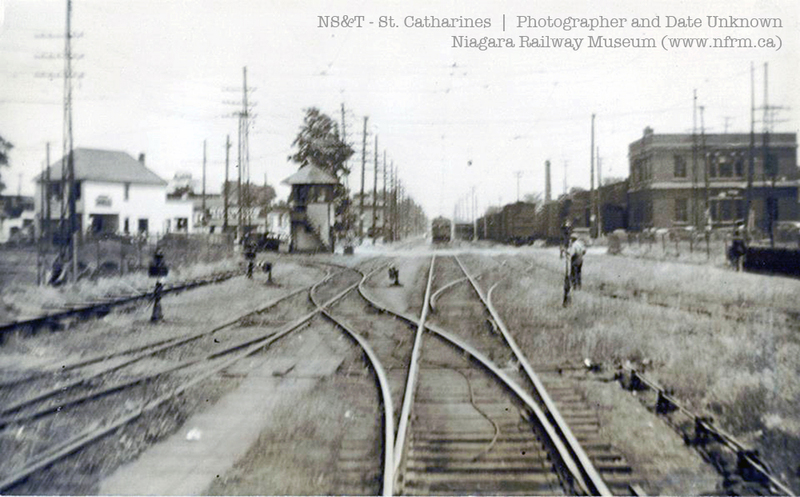 The track in the foreground is the line along Queenston to Phelps Street. 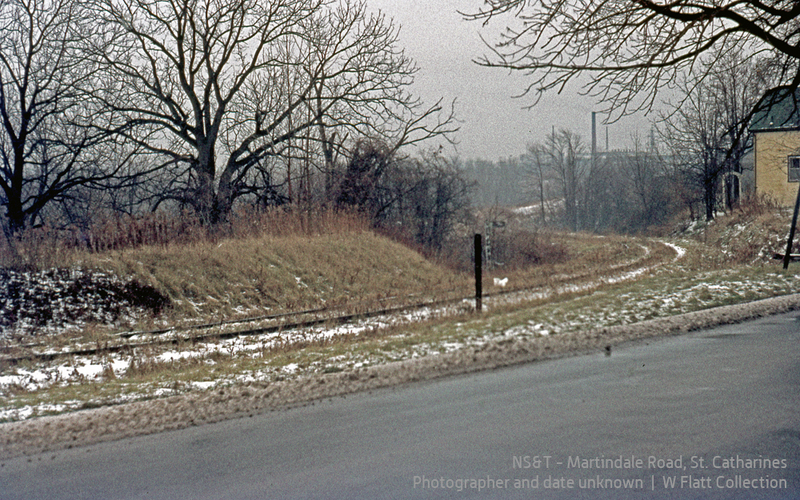 On the way to Port Dalhousie, after crossing 12 Mile Creek, the Niagara St. Catharines & Toronto Railway headed north along the side of Martindale Road. Before it could reach the port, however, it had to deal with another wet obstacle: Martindale Pond. Martindale Pond is a small artificial lake near the shores of Lake Ontario created to permit navigation on the first Welland Canal. (It also served as the route for the second and third canals: remains of locks from those canals are still visible.) The NS&T – and Martindale Road – crossed the pond at a narrow bay that jutted to the west of the pond. 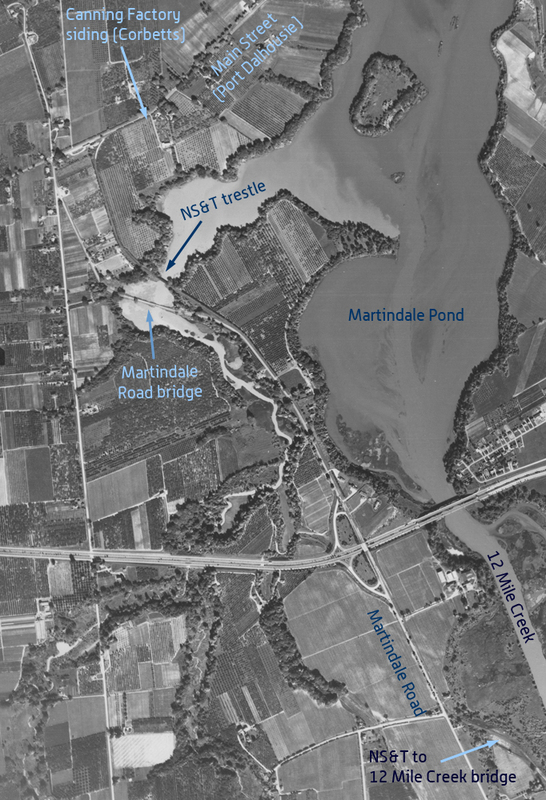 1955 aerial photo showing the Martindale Pond trestle, from the Brock University online collection. 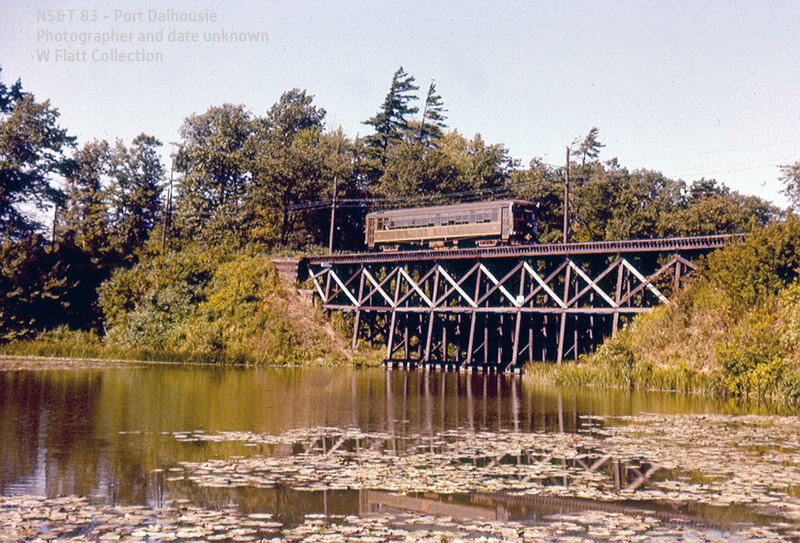 As it approached the pond crossing, the Martindale Road swung further to the west – away from the NS&T – then crossed the pond on its own bridge. This provided an excellent vantage point for railfans to grab photos like the ones shown in this post. Today, Martindale Road has been relocated to follow the roadbed of the NS&T and a new bridge exists where the trestle once was. The original alignment – now Old Martindale Road – is now a recreational trail. Martindale Pond from Old Martindale Road. Google Street View – 2018. In 1903, Martindale Pond was chosen as the site for the Royal Canadian Henley Rowing Course – a world-renowned rowing venue, and host to the Royal Canadian Henley Regatta. It hosted the World Rowing Championships in 1970 and 1999, and the rowing competitions held as part of the 2015 Pan American Games held in Toronto. Holiday-makers headed to Port Dalhousie for a day at the beach left from downtown St. Catharines, took the Louisa Street cut-off to Woodruffs siding, then slipped downgrade behind the McKinnon Industries plant to cross 12 Mile Creek – so named because the mouth of this waterway on Lake Ontario is located approximately 12 miles west of the Niagara River. 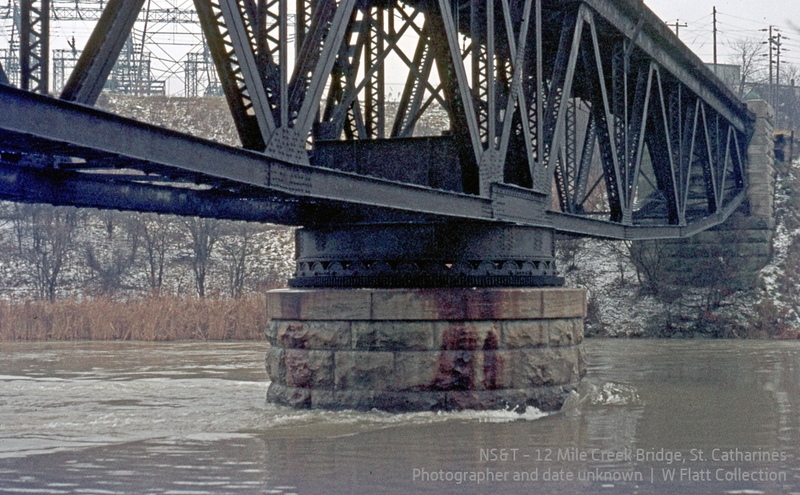 NS&T 83 is outbound in these photos, headed towards the photographers and towards Port Dalhousie. The white flags show it’s running as an extra movement – not on the schedule – which supports the theory that this is a fan trip. 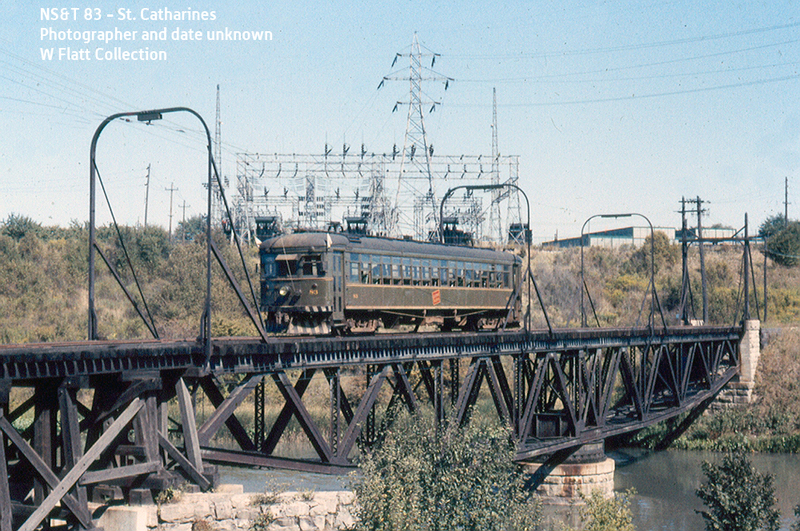 The line to Port Dalhousie was built in 1901 – so presumably, this is when the bridge was constructed. 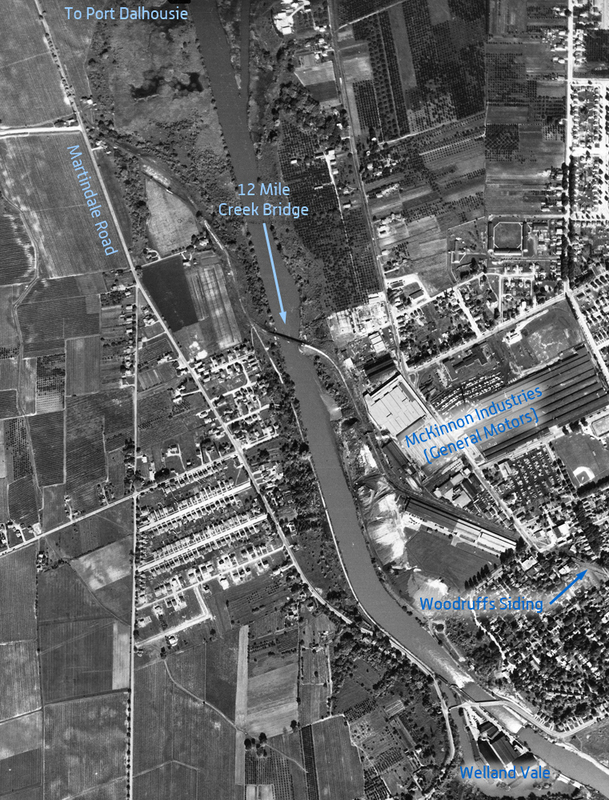 1955 aerial photo showing the 12 Mile Creek bridge, from the Brock University online collection. When the line to Port Dalhousie was built, 12 Mile Creek was no longer part of the Welland Canal: As part of the construction of the Third Welland Canal in the 1880s, the route was changed to cut diagonally southeast from Port Dalhousie. But there must’ve been traffic upstream of this bridge – or at least, the potential for it – because it was built as a swing bridge. This photo is a good illustration of the method used for supporting the overhead wire where the swing bridge meets the approach. This image provides a good look at the central pier, and the rollers upon which the bridge would’ve turned. The abutment on the far (east) bank features a stone column to the right of the steelwork that would prevent the bridge from rotating clockwise. Based on this, the bridge would’ve rotated counter-clockwise to clear the river for traffic. 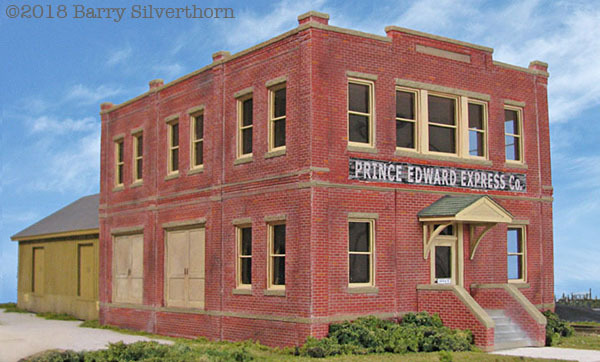 However, it hadn’t been opened for many years by the time these photos were taken. On the west side of the creek, the line climbed a hill to reach Martindale Road. In the above image, the photographer on the west side of 12 Mile Creek. He’s standing at the top of the grade, looking southeast down the grade towards the bridge. At the bottom fo the grade, just before the bridge, a spur left the main track and headed south along the west side of the water to Welland Vale. The roadbed from here to Welland Vale is now a recreational trail. 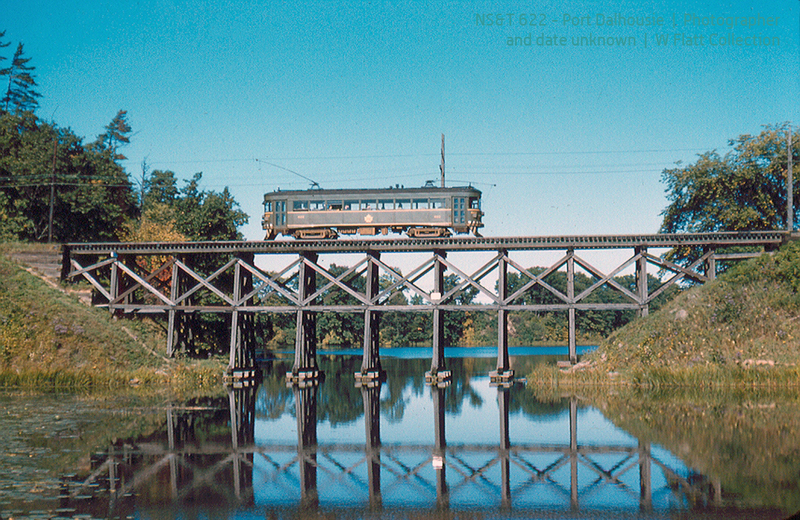 There was another bridge on the line to Port Dalhousie that was popular with railfan photographers – and I’ll share some photos of that bridge in a future post.